Our latest incarnation for 2016 is Mother Goose. The story of Mother Goose is possibly the oldest story to be turned into a pantomime. It dates back to an ancient Greek legend about a goose that laid golden eggs. It is also one of the earliest pantomimes seen in Great Britain, nearly two hundred years ago. 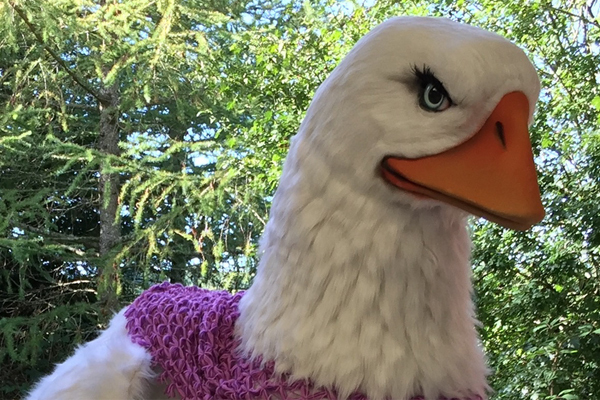 Our latest incarnation for 2016 is Mother Goose, she really does bring the show to life! Her mannerisms and movements have been closely replicated to how a goose actually moves, with full control of head and neck, with an incredible range of movement controlled by the puppeteer. Speech is made possible by the moving mouth, wings that flap on command, she can even flutter those luscious eyelashes at you. Mother Goose has wained in popularity over the last ten years, but with an increase in demand recently the show is making a comeback! Check out our video of her in action.